In practice, most of the physicians are in a fix as to what should be the second prescription, while turning up the pages; one can not find the complete drug relationship at one place. The most complete work is considered to be the work of Dr. R. Gibson Miller of Glasgow, which we find at the end of Boericke’s Materia Medica; wherein only 181 relations of remedy have been listed. But the latest catalogue of Synthesis offers 4,497 standardized remedy names, that means we have no data about the relationship of 4316 medicines, this app brings to the Homoeopathic profession what was lacking, although a lot of research in this clandestine area remains to be done but why not make use of the available data in a better way. 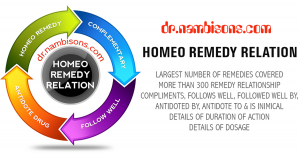 A new app in google play store “Homeo Rem Rel” can be downloaded for free on mobile, and can be used anywhere & the relationship of remedy will be on finger tips. Merely knowing that a remedy compliments the other is not sufficient. But what is important is, in what symptom or group of symptoms does it compliment the other remedy is necessary to be known. In this anthology I have gone through diverse sources & collected the information, this shall go a long way in placing a lasting reprieve to the sick. Though Hahnemann has given the indirect concept of relationship of remedies in his books Organon of Medicine and Chronic Disease Their Nature and Cure but Boenninghausen has represented it in a systemic way. So he is considered to be a pioneer of this concept. Later on various stalwarts have tried to explain the same relationship according to their perception. COMPLEMENTARY: Supplying the part of another drug. (Complementary medicine completes the action of previously prescribed medicine) e.g. : Relationship between acute remedies that are often needed and their complementary chronic treatment that is required to finish the case – e.g. belladonna – calc carb. SIMILAR: Drugs suggested for comparison by reason of their similarity; usually compatible, unless too similar, like Nux vomica and Ignatia. CONCORDANTS: actions of remedy are similar but of dissimilar origin to another. Examples of concordant remedies are China and Calcarea, Pulsatilla and Sepia, Nitric acid and Thuja, Belladonna and Mercurius, Ignatia and Zinc. It works in after Login in FB and internet needed . Kindly make possible it upline. Any research on inclusion body myosities ?